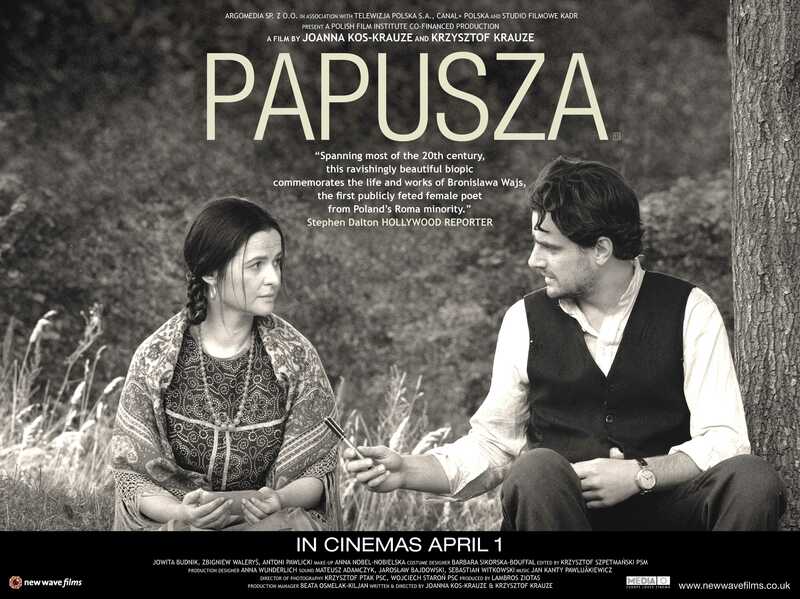 Papusza is based on the true story of the Roma poet Bronisława Wajs (1908-­1987). The film follows Papusza’s life from birth to old age: arranged marriage as a small girl, her life in a gypsy tabor before, during and after second world war, then forced settlement in communist Poland and urban life in poverty. Her meeting with the Polish poet Jerzy Ficowski, who discovered her great talent for poetry and published her works led to a tragic paradox: a famous poet was living in poverty, rejected by the Roma community for betraying their secrets. With beautiful monochrome photography, Papusza gives insight into the Roma way of life, soon to be swept away by WWII and the following communist regime. Speaking mostly in Roma language, the actors are mostly non­‐professionals from Roma families. Krzysztof Krauze (b. 1953, Warsaw) studied photography in Łodż (1978) and worked as a director for both Se-Ma-For and Irzykowski studios, and also with TOR (1985-91). For his feature debut New York, 4 AM (1988) he won the Bronze Lion at the festival in Gdansk, where he later won the Special Jury Prize for Street Games (1996). He won a series of awards for The Debt (1999) – Golden Lions and the Critics’ Award in Gdynia, the Eagle Award for Best Direction and Screenplay of the Year, and Best Direction at the Philadelphia IFF. He enjoyed international success (incl. the Crystal Globe at KVIFF 2005 and a Golden Hugo at the Chicago IFF) for My Nikifor (2004), co-written with his wife Joanna Kos-Krauze (b. 1972, Olsztyn), who also co-wrote and co-directed the films Saviour’s Square (2005 – Golden Lions at Gdynia and competition screening at KVIFF 2007) and Papusza (2013). (Karlovy Vary 2013). Krzysztof Krauze passed away on 24 December 2014. Read a longer biography here. In its attention to landscape, its extraordinary detailed mise en scene and its surrealist flights, the film has the feel of an old Tarkovsky movie." "Papusza is an exquisitely crafted biography with lush black-and-white photography and a superb performance from Jowita Budnik. A sombre but impressive production." "Papusza' offers a glimpse into the world of Bronislawa Wajs (Jowita Budnik), known as Papusza, the first Roma poet. Framed within a series of stunning monochrome portraits it reveals the Roma world, fiercely independent, secretive and isolated with an inbred distrust of gadjo (strangers, non-Roma), that was no place for a self-educated woman with a love of the written word. A disappearing world skilfully captured by cinematographer Krzysztof Ptak." “Striking portrait of a Polish- Roma poet...this selection of moments from the life of Bronislawa Wajs is gorgeous to behold. The black and white cinematography is gorgeous. Strikingly beautiful…"
Its stark cinematography fives a fascinating insight into the Roma way of life...But, above all Papusza is about an inspirational woman who was ahead of her times." ‘Some of the most spectacular black and white camera work in recent years’. 'The film escapes excessive stylization; one won’t find a trace of forced artiness in it. Its greatest advantage – just like in the case of Papusza’s poems – turns out to be its painstaking coarseness, the inconspicuousness, behind which veiled are the notable questions that escape the story of the poet herself, and which direct our attention to the essence of otherness in general – and to the essence of art. (…) Papusza’s tone is far from patronizing, the film challenges stereotypes and prejudices, but it also shows that we can only come closer to the 'other', Roma, side, to a certain extent'.